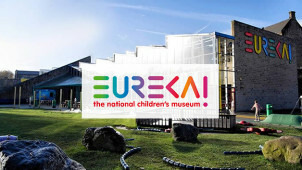 Inspired by the children’s museums in the USA, Dame Vivien Duffield launched Eureka! The National Children’s Museum, which was officially opened by Price Charles in Halifax in 1985, as the first national museum for children in the country. Located in Halifax, Yorkshire, Eureka! The National Children’s Museum cost £9 million to set up and is currently the only fully interactive museum in the UK that’s completely dedicated to children aged 0-11. They’re fully welcoming of the questions that children ask, however, weird and wonderful, and with over 400 interactive and fun exhibits on display, your little ones are sure to find their answers. The museum also houses 6 unique galleries to explore, each having a different theme. Each gallery is packed with fun activities, facts and figures, new things to try and discover, and buttons to press to discover what they do. Along with this, Eureka! also hold a range of family-friendly events throughout the year for you and your little ones to attend. Eureka! are also a registered educational charity with the aim of promoting and encouraging children’s learning and development through fun, playful and educational activities such as those available to explore in the museum. How do I use my Eureka! voucher codes? If you’d like to visit Eureka! The National Children’s Museum as much as possible whilst saving money, you might want to sign up to an Annual Pass. With an Annual Pass, you can visit the museum as often as you’d like in a year, without having to pay any extra making it a great option for those days when money is tight. When Does Eureka! The National Children's Museum open? Eureka! The National Children’s Museum is open throughout the year, and is open from 10 am - 5 pm during the school holidays. If you’re planning to visit the museum during term-time, their opening times are 10 am - 4 pm throughout the week and 10 am - 5 pm at weekends. Note that during term time, the museum is closed on Mondays. Is car parking free at Eureka! The National Children's Museum? Car parking at Eureka! The National Children’s Museum is not free. The car park is open every day from 5.30 am-pm and car parking costs £3 for up to four hours or £6 for up to twelve hours. How do I get to Eureka!? You'll find a post code to punch into your Sat Nav online here, as well as direction to ensure a smooth journey to the museum. Find out opening times for Eureka the National Children's Museum here. A trip to Eureka! The National Children’s Museum is one of the best ways to introduce your kids to the power of interactive learning. With play exercises, experiments, hands-on exhibits and a massive range of other fun and interesting new things to learn and try out, a Eureka! discount code will encourage hours of endless fun for up to half the price. Located in the heart of Halifax, the Museum is aimed at kids aged 0-11 years old and there’s plenty for the grown-ups to learn, too! Eureka! The National Children’s Museum isn’t just an educational and fun day out for kids – they also offer friendly and cost-effective childcare in the heart of Yorkshire. Eureka! Nursery is designed for pre-school children and is uniquely set in the grounds of the museum, providing little ones with plenty to do all day long! If your little one is soon to celebrate their birthday, why not enjoy their big day at Eureka! National Children’s Museum? The museum offers a range of flexible birthday party packages, with something included to suit all budgets. A Eureka voucher code could cut the cost of your package or even enable you to rise to the occasion and afford a bigger package for the birthday girl or boy. With an array of party themes to choose from, your child won’t be forgetting their awesome birthday in a hurry!